You probably know at least one person who keeps a diary, gratitude journal, or bullet journal. But can writing be a legitimate therapy to improve our mental health? According to science, yes. Writing is an accessible and cost-effective option that has demonstrated excellent benefits. And the best part about it is that it’s available whenever you need it, and you can take it with you wherever you go. Whether it’s 4 a.m. when you can’t sleep, after the first day of work at your new job, or even on your wedding day, it’s always there when you need it. The truth is, almost everyone can benefit from some kind of writing therapy because everyone has problems, and writing things down can ultimately help you understand how you’re responding to the things that are happening around you. Self-understanding and self-awareness are crucial elements of personal growth. Want to try writing therapy for yourself? If you’re dealing with a serious mental health issue, it’s always best to consult your doctor or an expert before changing anything about your treatment strategy. But once you’ve done that, simply pick out a method outlined below and put pen to paper. It’s as simple as that! This type of writing therapy is pretty straightforward. All you have to do is write down whatever comes to mind. It could be images in your mind, thoughts, events, sights, smells, or sounds. Be free and don’t worry if it doesn’t make sense at the time. When you go back and read what you put on paper, you’ll likely be able to draw some knowledge or perspective. Regardless, writing things down freely can have a cathartic effect. Reduction in resting blood pressure levels. Improved mobility and reduced pain in rheumatoid arthritis patients. Reduction in anxiety and depression symptoms among patients with maladaptive rumination. Reduction in depression symptoms, trauma-related cognitions, and behavioral problems in children with post-traumatic stress disorder. Decrease in disease symptoms and improvement in cognition in irritable bowel syndrome patients with longer-term disease. Reduced health care visits and reduction in physical symptoms in patients with colorectal, breast, or prostate cancer. Improvements in lung function in adult asthma patients. 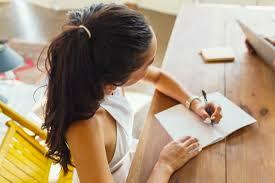 Immune functioning was found to be boosted with expressive writing. HIV/AIDS patients who wrote about negative life experiences produced higher CD4 lymphocyte counts. In another study, people who wrote about traumatic experiences before receiving the hepatitis B vaccine had a stronger immune response, producing more antibodies. It is important to note that both Dr. Pennebaker, one of the major researchers on expressive writing, and Dr. Susan Lutgendorf, a health psychology researcher who has also done research on the subject, stress that in order for expressive writing therapy to yield benefits, people must find meaning in the traumatic memories and allow themselves to feel all the associated emotions. In your reflective diary or journal, you write down your positive or negative experiences, any associated thoughts, and what you learned from them. For instance, if you participated in an event or class, write down what happened and include your thoughts and ideas about what you learned and how it helped you grow as a person. It’s best to reflect as soon as possible after the event; don’t wait too long, or you won’t remember all the details! This is why you should always have your journal nearby and make it a habit to make regular entries. One of the best things about a reflective journal is that when you look over at previous entries, you can gain new insight. It’s always rewarding to see how far you’ve come. Reflective journaling has been found to encourage critical thinking and self-reflection, and classes that involved reflective journaling yielded positive results, such as the development of cultural humility. It’s always a good practice to slow down, take a deep breath, and ask yourself what you’re grateful for. It’s even better to write these things down once or twice a week. Gratitude induces brain activity in the anterior cingulate cortex and medial prefrontal cortex, areas that are associated with moral cognition, value judgment, and theory of mind. Dr. Robert Emmons, an eminent researcher on gratitude, has found that counting blessings by gratitude journaling can have a positive effect on the subjective well-being of participants. Even more? Research has shown that gratitude can help you sleep better, care for your own health, and help reduce depression. Do you have unfinished business with a friend, partner, or family member? Perhaps you wish to fully express yourself to someone but haven’t been able to or never will. You can write everything that you want to say in a letter, and you don’t even have to send it. This type of therapy will help you release the burden you may be carrying and can be an intensely cathartic experience. Many people already know the therapeutic benefits of reading, but not as many people realize that they can simply turn to a pen and a notepad for some serious mental health support. You may finally be able to let go of the hurt you’ve been carrying once you write an unsent letter to someone that wronged you in the past. Perhaps you can allow yourself to feel the negative feelings, and not numb out, when you feel ready to write down how a particular traumatic event affected you and reflect on what it means to you. Writing therapy will always be there for you, even if a therapist cannot be present. So take advantage of this accessible therapy, and write your heart out!